Back in January this year I wrote about how Tate's BP funding figures revealed - less than expected. I've not yet found the decision notice for this - it's certainly NOT on the Information Commissioner's website (as I write). This is a summary of the hearing back in May when the Tribunal heard representations from all parties regarding the withholding of information by the Tate. further protests and a published report by activists (see below) who would like to see an end to all sponsorship of the arts by BP. the signing this week of NEW agreements for BP sponsorship with four major organisations on the UK Arts Scene - namely the British Museum, the Royal Shakespeare Company, the Royal Opera House and the National Portrait Gallery. One might conclude - given the drop in profits - that arts companies could easily have been looking at a really big "black hole" in their finances had the change in BP's financial fortunes led to non-renewal of the sponsorship. It's one thing to say BP is not the right sponsor for the arts. However it's quite another to make sure arts organisations are adequately funded in appropriate ways! It's naive for protesters to think that any commercial sponsor will provide funding unless there is some sort of benefit for their product or brand. It is however entirely legitimate to ask how the relationship between the sponsor and the sponsored organisation is managed - and whether this complies with all relevant legislation and conduct codes. 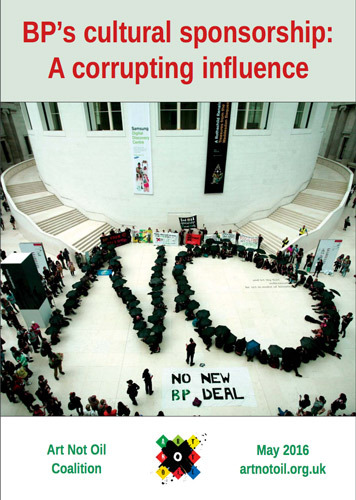 The Art Not Oil Coalition - who are part of the part of the international movement for #FossilFreeCulture - has been damning BP for a long time. It published a report in May 2016 - see BP’s cultural sponsorship: A corrupting influence. This drew on information gleaned from a lot of emails released under the Freedom of Information Act. I do wonder if all the staff at museums and art galleries got the training that government staff got when the Act Act came into force. I think maybe some of the HR people in museums and art galleries might like to think about some "refresher training". Ethical questions raised Why are security personnel at publicly-funded cultural institutions discussing shared anti-protest measures with a corporate sponsor and oil company? In whose interests do security personnel act when responding to legitimate protest? Given the tendency of protestors to hurl around oil and gain entrance to museums before they start their protest, I personally would have thought the answer to that question was self-evident. In addition, large iconic buildings tend to be targeted by those wanting to cause mischief and terror - and if a corporate sponsor wants to offer support in relation to security, I'm not sure why management would see fit to turn it away. After all, not all philanthropic support needs to be by way of funding. Interestingly the BP Portrait Award is the only competition I can think of where a representative of BP sits on the selection panel for the competition.